Two well-known politicos enjoying some lunch time King Tacos. Great Thursday Lunch Hour to all as we near the end of another work week and cruise into the next weekend. Here are some tasty lunch time political bloggin munchie missives to ward away the post noontime political brain drain. What honors (of dubious distinction?) await CD 14 City Councilman Jose Huizar? Awaiting the signature of his Political Papi Mayor Antonio Villar on the final approved backroom-drawn maps that will become the litigious byproduct of City "City Redistricting 2012", the "Princeton Graduate Dear Charro" of Boyle Heights can't hold back his thirst for exerting political control over most of Downtown LA. Just as the public was excluded from commenting on the City Clowncil Central Committee's final act to approve the boundaries of its "fifteen self-enrichment zones" , the "Princeton Graduate Dear Charro Corleone" was exerting his will upon the weaken out-going CD 9 Councilwoman Jan Perry regarding a signage zone in the South Park area of downtown. Jose Huizar ‏@josehuizarThe Great One @OfficialGretzky will be @ LA Brewing Co on Broadway in DTLA tonite 4 @LAKings Game-Gretzky Bringing Back Brdway-Go Kings Go! (** We ascertain via the Facebook comments of one Michael "MEAT" Trujillo, former Councilman Huizar Campaign Manager and Redistricting 2012 Commissioner, that he is a co-owner of this establishment). 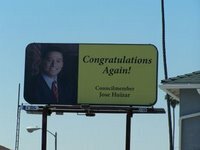 ..... marketing the councilman as the best option for a better downtown has been the paramount priority of Team Huizar. But meanwhile in "old CD 14", an historic mural is no more. ....... another tragic lost of CD 14 cultural history which prompted this response by former CD 14 City Councilman Nick Pacheco. 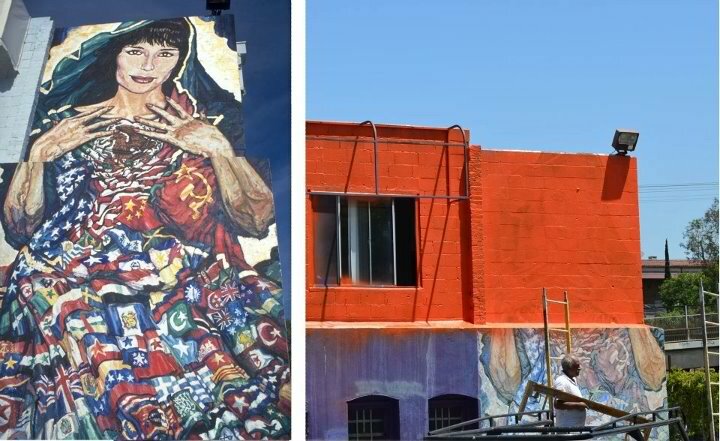 Nick Pacheco How in the hell does the building owner get permits to convert the building to lofts and no one at City Hall or Councilman Huizar protect the mural.... tragic!!! I can't stay quiet on this one!! 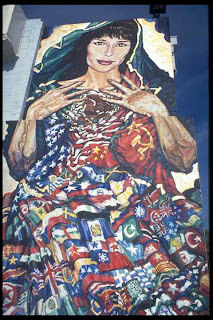 I love George Yepes' work.... too bad I can't afford it. ...... and CD 14 can't afford six years of singular downtown attention. Scott, I just want people to have some respect for the USA Independence Day. Every year Councilman Huizar, not an american born, continues to celebrate "FIRE WORKS" instead of of celebrating American Independence Day, is an insult to all American, and how dare him stand with our Veterans of war to remember those that have fought to keep our independence. And why are we spending American Tax dollars to condencen 4th of July by having a fireworks festival, and no mention of the importance of our independence. Call Huizar and your councilmen and let them know how you feel. American Independence is for everyone in the USA, whether legal or not legal. Huizar has got to have the laziest staff of all time. How can you let an iconic mural be painted over? Especially in Boyle Heights! If they claim they are not lazy then they are incompetent. But then they are just following their leader - and this time I mean Ana Cubas. 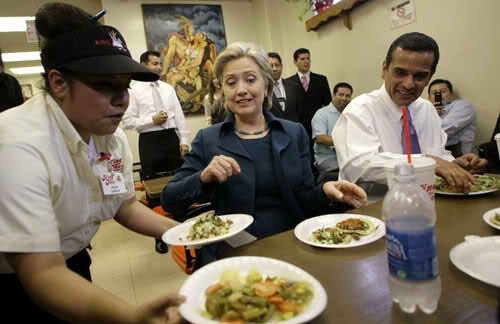 If she weren't so lazy you'd think she shower once in a while - $147K a year and you look like that? Huizar's chief of staff Ana Cubas is just as bad. Ana Cubas never follows through on anything. A big joke to taxpayers! CD9 does not like carpet baggers! Move back to CD1 please. do not vote on promises, vote on the fact of accomplishments related to political action. Look for facts, not lies. Huizar did not bring millions of dollars to Boyle Heights, the millions he is talking about is the gold line, thanks to Congresswomen Roybal, Huizar's office did ot get involved, where are the goldline safety gates in Boyle Heights, specially on Indiana and First with high pedestrain traffic. He also takes credit for new school, Mendez, that as the Parents and the community that did not allow LAUSD and Huizar to stop the construction. He has a bunch of incompetent kids working for him! All single, no kids, no commitments....partying is their priority! Want Publicity? Send Legal Letters to MayorSam!